Trouble arises when the heart can't properly relax. Relaxation is every bit as important for your heart as it is for the rest of you. If for some reason the heart has trouble relaxing between beats, then it can't fill completely. Less blood pumped with each contraction sets the stage for a "new" type of heart failure that goes by many names: diastolic heart failure, heart failure with normal ejection fraction, heart failure with preserved systolic function, and others. Diastolic heart failure isn't really new. It's just that doctors now have tools that let them see how this form of heart failure differs from "regular" (systolic) heart failure. Up to half of the 600,000 Americans who develop heart failure each year have diastolic heart failure. Both types of heart failure result in the same thing — the heart has trouble supplying the body's organs and tissues with the oxygen-rich blood they need. Diastolic heart failure, in which the left ventricle stiffens and bulks up, is different from systolic heart failure, in which the left ventricle becomes weak and flabby. Ejection fraction, a key measure of the heart's pumping ability, is normal in diastolic heart failure and low in systolic heart failure. As researchers search for the best treatments for diastolic heart failure, controlling blood pressure and fluid in the body are key strategies; heart-protecting drugs may be helpful. Every heartbeat has two distinct phases. During systole (SIS-tuh-lee), cardiac muscle fibers contract in unison. This makes the heart twist a bit and close in on itself, propelling blood to the lungs and the body. During diastole (die-AS-tuh-lee), the muscle fibers relax and stretch. This lets the four chambers expand and fill with blood as the heart untwists, creating suction that helps pull blood into the ventricles. Aging takes some of the spring out of the muscles in the heart. High blood pressure, cholesterol-clogged coronary arteries, muscle damage from a heart attack, a malfunctioning heart valve, diabetes, anemia, an overactive thyroid gland, and other problems can also stiffen heart muscle and bulk up the muscle inside the left ventricle. Diastolic heart failure looks and feels just like systolic heart failure. Its hallmarks are shortness of breath with exertion or when lying down; swelling in the legs, ankles, or abdomen; unexplained fatigue; or a bulging jugular vein. The main way to distinguish one type from the other is with an echocardiogram. It can show the size and shape of the left ventricle and gauge how it is functioning. It can also determine ejection fraction — the percentage of blood in the filled left ventricle that is pumped out during a contraction. A low ejection fraction (under 35% or so) with symptoms equals systolic heart failure; a normal ejection fraction with symptoms equals diastolic heart failure. 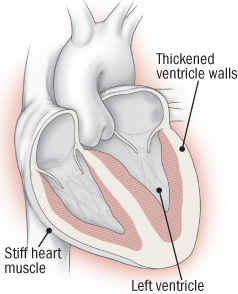 Open space inside the ventricles can be restricted by heart muscle that "bulks up" due to overwork or other causes, or that stiffens and loses its flexibility. The big problem with diastolic heart failure is that doctors don't yet know the best way to treat it. Therapies proven to work for systolic heart failure (characterized by a thin, flabby left ventricle) don't necessarily work for diastolic heart failure (characterized by a thick, stiff left ventricle). Scores of clinical trials investigating possible treatments for diastolic heart failure are ongoing, but solid results are still a ways off. how fast the ventricles beat in people with atrial fibrillation. Treatments the heart groups suggest might work include angioplasty or bypass surgery when blood flow through cholesterol-clogged coronary arteries hampers heart function, and the use of ACE inhibitors, beta blockers, or calcium-channel blockers to help ease symptoms. Watching salt and fluid intake, as well as regular exercise, may also help.